The 2017 International Consortium for Health Outcomes Measurement (ICHOM) Conference content is now available in a variety of formats. 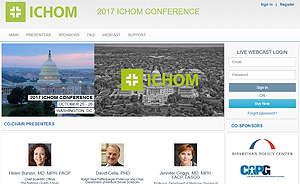 Online Archive of 2017 ICHOM Conference Presentations today! Flash Drive of 2017 ICHOM Conference Presentations today! WASHINGTON, DC USA -- HEALTHCARE UPDATE NEWS SERVICE -- NOVEMBER 6, 2017: The International Consortium for Health Outcomes Measurement (ICHOM)'s 2017 Conference was held October 25 - 26, 2017 at the Marriott Marquis in Washington, DC. The Conference content is now available for purchase. Globally, value-based health care (VBHC) is transforming practice and informing both payment and policy. As innovative organizations from across the health sector unite around a common aim of optimizing outcomes for patients, each has come to understand the respective role they must play in driving the value agenda. With this in mind, we invite you to join health system leaders from around the world for the 2017 ICHOM Conference, where we will discuss progress and perspectives on value, with overarching plenaries from international experts and breakout sessions targeting topics critical to enabling and accelerating the shift to value-based health care. Accounting Professionals: Approved for up to 11.0 NASBA CPE credits. Physicians: Approval for 10.0 AMA PRA Category 1 Credits.